A desert safari is a must-do while visiting Dubai; booking in advance guarantees against sold-out days and times. 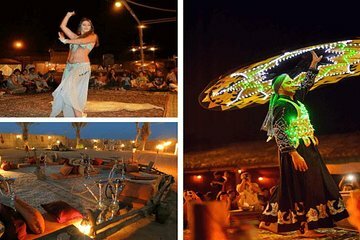 This tour includes all the most popular activities: a belly dance show, a traditional tanoura dance show, henna painting, shisha, and other entertainment in the Bedouin camp. You'll also get to go dune-bashing in a 4x4 vehicle and try your skills at sand boarding and camel riding.